If you do believe that children are innocent in the eyes of God, wouldn’t it be reasonable to suggest that abortion doctors are winning more souls for Christ than Christian missionaries? Why not bomb a pre-school? That would surely win a lot of souls for Christ. So what do you think? Is it reasonable to suggest that we should kill people into the Kingdom? I’ve heard people (utterly despicably) use this question to try to lessen opposition to abortion among Christians, saying that killing unborn babies is in the babies’ best interest. But I think this particular formulation of the question is being used as a “taking the roof off” tactic—that is, it’s trying to show that the Christian worldview is absurd and that we’re not living consistently within it. In this formulation, the asker is assuming we’d be opposed to missionary killing, but he’s challenging us to explain how we reconcile our actions and our beliefs. To answer this challenge, you’ll need to think through some theology—what we know to be true about God, man, and the role God has given us. We’ll hear Alan’s answer on Thursday. 1. It may not be true babies and embryos automatically go to heaven when they die. According to the doctrine of original sin, Adam’s sin is imputed to us. 2. Human life is valuable because all humans bear the image of God, and we are explicitly forbidden to take life without good justification (Genesis 9:6). 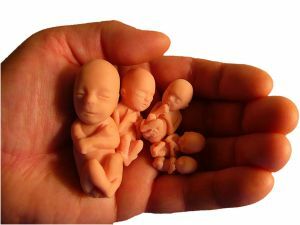 Even if killing babies and embryos would guarantee their automatic salvation, we don’t have the right to kill them for that reason. 3. Man’s chief end is to glorify God and enjoy him forever, which includes, among other things, that we praise him. But according to Psalm 115:17 (among other places), the dead do not praise God. I think Sam makes a good point at (2). Perhaps the unborn go to Heaven if they’re aborted, but it’s God putting them in Heaven. WE are just killing them, and it’s wrong to murder. I’m not sure I would even dignify this question with a response. If you took this ridiculous argument to its logical conclusion, you would also dignify killing newborns for any kind of birth defect or killing new believers as soon as they become Christians. I suspect anyone that would ask this question isn’t really serious about having a discussion, but rather looking to throw something out that a Christian may have a tough time responding to. I expect that some Christians would get this question and find themselves torn between the idea of souls being added to Heaven and saving lives on Earth. God makes it clear that human life has value. We are created in the image of God. We are not created for destruction, but rather to grow into beings that can develop a relationship with God. By ending lives prematurely, we rob those individuals of the opportunity to develop that relationship and to learn and grow in Christ by developing in this world. If I were talking to someone that was serious about pursuing this kind of questioning and was unwilling to see that this is not a rational argument, I would probably have to end the conversation at that point. If you took this ridiculous argument to its logical conclusion, you would also dignify killing newborns for any kind of birth defect or killing new believers as soon as they become Christians. That might be their point too, though, if they think our position logically leads to that stuff. You’re right Kyle. Amy pointed out the same thing above. My main issue is that the argument rests on a particular assumption, that any child that dies before the ‘age of discernment’ will get an automatic pass into heaven. Since the Bible is basically silent on this issue, assuming for the sake of the argument that all children that die go to heaven will lead potentially to a false conclusion. That’s why I think the argument itself is ridiculous, since the assumption is not a given. But how many Christians really understand that? The real problem is that we don’t truly know if an aborted baby would necessarily go straight to heaven. As Sam pointed out in his item #1 above, we don’t have 100% assurance that a baby or a child that dies before what many Christians refer to as the ‘age of discernment’ will go to heaven. The Bible doesn’t teach this doctrine, but many arrive at this conclusion by inference. If you look at 2 Samuel 12:23, you probably get closest to any kind of answer as David, considering his dead child, notes that “I will go to him, but he will not return to me.” Many assume, and teach, that David knows that his child is in heaven, and they will be reunited some day. I’ve heard many people use this as a confirmation of children going to heaven when they die, but that may be drawing too much of a conclusion from a single passage. Even if this passage is an assurance that David will be reunited with his child in heaven, it can only be said it is an assurance for David, not for all people. I, for one certainly hope that assurance is true for all, but I have to say I just don’t know. What we do know, and can be certain of, is that the soul of a dead child is in God’s hands. What he chooses to do from there is entirely up to him. Coming from the Reformed position, I have to look at Romans 9 and give consideration to the idea that God has mercy on who he will have mercy, so it’s not up to man, but God to decide. Some vessels are created for mercy, some for wrath. Romans 9 also tells us that God decided the fate of Jacob and Esau before they were born.I like to think that all children who die would get a free pass, but since the Bible doesn’t clearly teach that doctrine, we’re left with a grey area that is up to our interpretation. I don’t want to turn this question into a debate of Reformed versus Arminian points of view, but it’s something that may have to be considered if the original question were to lead in that direction. So, have they ‘taken the roof off’ of our belief? An unprepared Christian in this discussion may find themselves disarmed. For a properly prepared Christian, it doesn’t have to be so. Either way, depending on how you answer this argument, you’ll probably have a hard time making head-way with someone who would ask this. The Bible makes it very clear that God alone is the author of life and death. Unless we have proper justification, it is never our duty to decide whether it would be better for a person to live or die. One thing that really bothers me about this challenge is that it assumes we can find a loophole by which we can manipulate God’s “system.” Rather than bringing people to Christ by glorifying Him through telling people about the gospel, we can just take a short cut and murder people into the Kingdom via a loophole. This is an atrocious view of God, His purposes, and our place in this world under His sovereignty. this week’s challenge is an appeal to the absurd, and such arguments can be dismantled by switching the terms and exploring the motives of raising such a point. We can easily detect the bias and demonstrate the outrageousness of the proposition by turning the issue to some other group. If all atheists would submit to procedures of abortion, the world would be less smug and arrogant. If all Chinese would submit to procedures of abortion, the world would be no longer under threat of overpopulation. If al coyotes would submit to procedures of abortion, all road runners could dash about in relative safety. This whole argument easily implodes if we break the whole matter into its basic structure: If GROUP A, accomplishes TASK B, it reaps BENEFITS C. If it is determined that such actions against GROUP A is prejudicial and biased, it is simple bigotry. In dealing with TASK B, we must wonder if it is ethical and suitable to the situation. Sam Harper is correct in his assessment of aborting Christian babies in stating that BENEFIT C could never be attained by the suggested method. Therefore, I could never accept the argument on the grounds of it being a sincere complaint against … well what is being complained about? Christians? Their stand on abortion? Their belief in heaven? This argument shows some rather vacuous thinking. And, in light of running the risk of offending atheists, the Chinese, and coyotes the world over, anyone can reject this line as convoluted reasoning at its worst. I think this is a theological issue. It boils down to this question: how is a person saved? We know that a person is saved by repentance and faith in the Lord Jesus Christ, trusting in Him alone for salvation. What of the unborn, or the person who lives in some far and distant land who has never heard the gospel, or the blind/deaf/mute? They are unable to comprehend and respond to the call of the gospel. Where is the hope for them, born in sin? I come from a particular theological point of view, but I think it’s the one that provides a satisfactory answer. And that answer is the same for everyone. Before a person believes in Jesus there is something that happens inside the sinner that makes everything possible, and that is where our answer is. It’s the new birth. This new birth, or regeneration, the implanting of a new disposition in the sinner’s soul, is what brings him into the kingdom of God. And this new birth is something that God accomplishes in man, according to His will. (Jn. 1:13; 3:8) Whether it is for the likes of you and me, or the unborn, or the man in some remote part of the world, or the deaf/dumb/blind, it is the new birth that enables us to partake of eternal life. This is man’s only hope.